Our core values are important to us. We think of them as community guidelines, and use them to help inform everything from performance reviews to product roadmaps to peer recognition! We ask questions related to our values in interviews and when doing self-assessments for personal development, and we do our best to align our actions to our beliefs. Every week at our Friday Forum (a mini-All Hands meeting, as a recap of the past week), Disqussers have the opportunity to present each other with Upvotes: recognition peer-to-peer for exhibiting one of our five values. Upvotees receive a coaster representing the value for which they were recognized, as well as the applause and accolades from their coworkers. 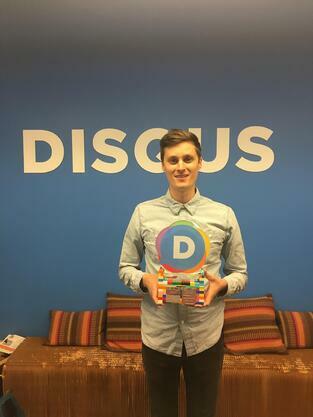 In addition to these weekly Upvotes, we honor one special Disqusser each quarter with the coveted Featured Disqusser award. This award goes to the person who most exemplified all five of our values in the previous quarter; the recipient receives the trophy, a cash bonus, and of course, copious accolades. We solicit nominations from the whole company and a committee representing a cross-section of employees meets to determine that quarter's honoree from the top-three most nominated Disqussers. The honoree is determined by a calculation based on stack-ranked points of anonymous ballots. There's no arguing for votes or pressuring each other to sway to one side or the other. We like to refer to the committee meetings as a "love fest" where we sit around for an hour talking about how fantastic each of our three nominees are. It's easily one of my favorite parts of the quarter. What was your reaction upon learning that you were the Honoree? I was humbled knowing that a committee of my peers felt that I embodied what it means to be a Disqusser. 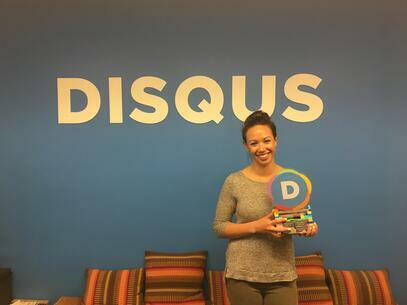 What is your favorite thing about working at Disqus? At the risk of being unoriginal, it has to be the people. Disqus is uncompromising in its commitment to finding kind, intelligent and talented people to join the organization. A team is most effective when every individual takes ownership of the final product. Disqus has taught me that no matter what your role, you should engage and involve yourself in every piece of the organization. What has been your favorite project that maybe nobody knows about? Collaborating with Rhapsody on a Sponsored Comment campaign where we embedded their music player directly within our Native ad-unit. I'm constantly surprised at the scale at which we operate with such a lean team. What does being a Featured Disqusser mean to you? It means you've contributed not only your work but a piece of what makes you unique. What are you looking forward to most about serving on our committee next time? The opportunity to reflect on the individual contributions of each nominee and the lasting impact they've had on the company. I was definitely caught off-guard. 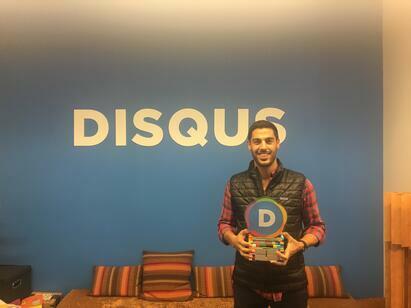 At Disqus, there’s no shortage of talented, awesome, and hardworking people so I felt honored and surprised to be recognized within such a fine group of folks, many of whom I look up to and learn from on a daily, if not hourly, basis. Also, our “committee” is super good at keeping the selection process secretive so that the grand reveal is maximally exciting… it’s the closest I’ll get to winning an Emmy. I love the “small town” feel at Disqus. We’re a small team and I think this encourages everyone to feel invested in the decisions and outcomes that occur every day. Additionally, the small team vibe encourages experimentation and growth. As someone who started at Disqus as an intern, I’ve always valued the learning opportunities that arise when a small group of people need to get crafty with limited resources. Ask people what they’re working on and what they’re excited about. Some of the coolest projects, features, and initiatives I enjoyed collaborating on have arisen organically from lunch table discussions and casual rants. I would kick myself later if I didn’t mention an ongoing project, internally called: #mods-disquschannels. It’s a Slack group of amazing community leaders that collaborate directly with Disqus’ support, marketing, product, and engineering teams. Shout out to ghostpear, Lord Bokeh, 3summerbutterfly, CaliCheeseSucks, forkless, and kandric --these Disqus experts share valuable feedback with us and also help out fellow publishers and commenters on Discuss Disqus and Channel Chat. Doggos barking in the middle of a meeting. I think the award is a chance to celebrate diversity of skill set, background, identity, and personality. I love that we recognize our peers for the unique qualities and quirks that they bring to our team, rather than just identifying who fits an archetype or mold. Homogeneous teams are boring! I’m stoked to listen to people gush about those peers they work with closely, whom I may not personally know very well (yet). The stories and anecdotes shared in past committees have always provided me a new perspective on a teammate and some hearty chuckles. I felt how Jennifer Hudson felt winning an Oscar - truly touched and overwhelmed with emotion. The Disqus famz. It is such a blessing to work with such a smart, fun, diverse, and dedicated group of people that inspire me to be better. Failing fast and failing forward -- embracing how to learn from mistakes rather than dwell on them. Setting up and configuring our Business Intelligence tool (Looker) to make data more accessible across the company. It's been really rewarding to see how the company's data needs and fluency have evolved over the last few years, especially since we've made data more self-servable. The workplace transparency. It encourages and empowers all employees, no matter what level, to pitch ideas, express opinions, and ask questions. It's like when Tom Hanks said, "Earn this" to Matt Damon at the end of Saving Private Ryan. I feel a responsibility to be worthy of the honor granted to me by my peers, who admire and respect wholeheartedly. Talking about my co-workers behind their back (with love). Complete surprise. It was a masterful reveal that caught me off guard. The team. We’re a small group and it’s really easy to get to know everyone. People here are so darn smart and it’s a privilege to be able to learn from them every day. I’ve learned that at a company our size, if you don’t do something, nothing will happen. It’s so common at larger companies to ignore bigger issues and safely assume that someone else will be working on it. That does not apply when you’re a startup and that’s both terrifying and empowering at the same time. When I first joined Disqus as a Community Manager Intern, I started a series called Life at Disqus, where I interviewed interesting people at the company and shared on our social media channels. Every week, I would feature snippets from a recent interview and the feedback from the community was fantastic. Towards the end of its short run, I no longer had to beg for recommendations on who to interview. The interview candidates came to me instead! It means that my work isn’t done yet. It means that my peers will be looking to me for guidance and that I should be proactive in supporting my teammates more than ever before. I hear that there are treats served during these meetings so that is definitely near the top of my list. That's all for now! 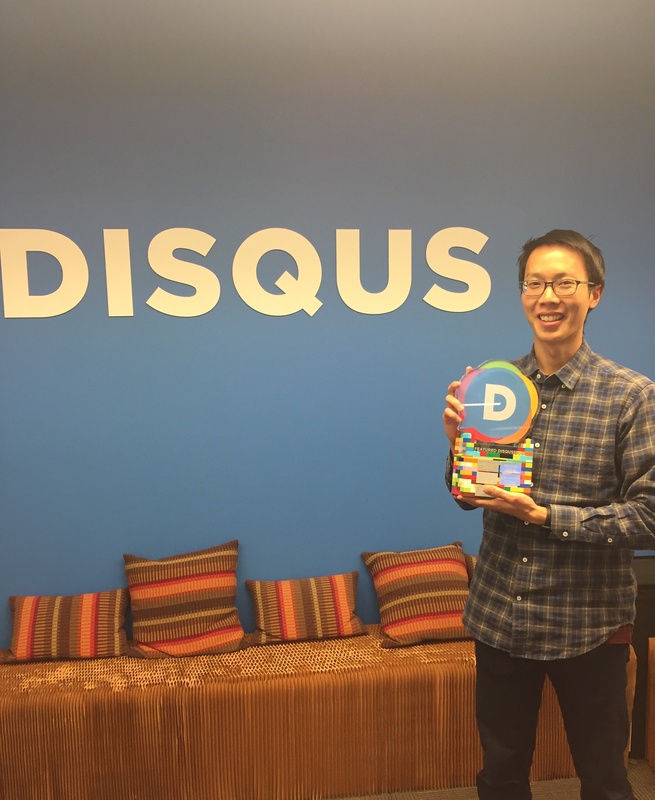 Stay tuned for more about Life @ Disqus!